Feeling just ducky with the BDN Homestead team. From left to right, Sam Schipani, Julia Bayly, Sarah Walker Caron and Aislinn Sarnacki. It says something about where I am in life that the prospect of transporting two domestic ducks from the St. John Valley to Bangor created hardly a blip on my internal radar. I mean, really, how much trouble could two ducks create in a four-hour drive? 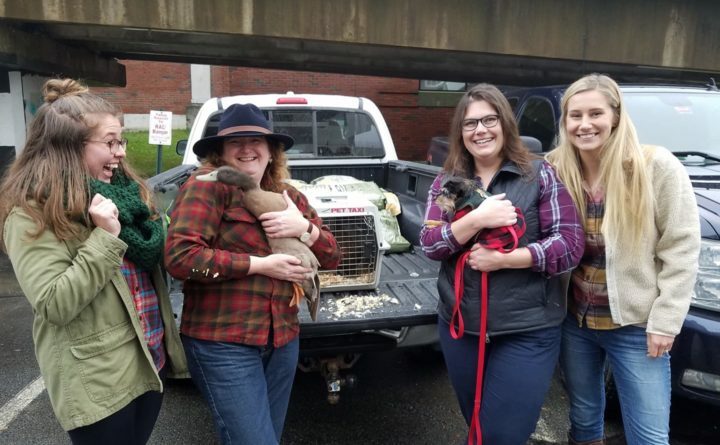 The adventures of Donald and Petunia — two khaki campbell ducks — began as so many seem to these days, with an innocent request on social media wondering if anyone was traveling south from Fort Kent to or through Bangor. As it happened, I was in a week’s time. And since it’s nice to be helpful I responded as such. That’s when I learned that a deal had been struck for Donald and Petunia to be rehomed from their coop in Frenchville to their new digs in Bangor. The reasons why do not matter. What was important is they needed a lift south. So it was on the appointed day at the appointed time that Donald and Petunia were delivered to Rusty Metal Farm, safely tucked into a large pet carrier. They were quite calm as they watched me pack Chiclet into her carrier and our luggage into the front passenger side of my pickup. They made hardly a sound when I then placed them on the back seat in the cab of the truck. This, I thought as I pulled out of the driveway, is going to be a snap. And it was, right up until we hit the first bump in the road. Literally. Turns out, these two ducks, or perhaps all ducks in general, are not fond of rough rides. At every pothole, every frost heave, every set of train tracks or other road imperfections Donald and Petunia would let out impressive quacks of protest. Ever driven on Route 11 from Fort Kent to the Interstate? It was 100 bouncing miles and close to two-hours of quacking. When they were not commenting on road conditions, they had a lot to say about my music for the road trip. Granted, I do have a somewhat eclectic playlist for travel and I honestly don’t know if they were singing along with Van Halen and Johnny Cash or begging me to turn it down. What I do know is every song by those performers elicited more quacks. Then again, now that I think about it, perhaps they were commenting on my own off-key singing. Now, ducks in trucks does not happen every day in Bangor, as far as I know. So, when my fellow writers on the Bangor Daily News Homestead desk learned of my transport, there was an immediate request that I stop in before delivering Donald and Petunia so they could meet them in a sort of pop-up petting zoo format. That seemed a reasonable request. After all, we on the Homestead beat are all about farm critters. It also made for a perfect place to meet the ducks’ new owners and hand them over. Two ducks, one stone, if you will. The plan was to pose as a team with the ducks for a Homesteady group photo, Chiclet included. There was just one flaw in the plan. Turns out my Homestead colleagues — three of the most courageous, brightest women I know, women who have faced and overcome amazing obstacles, have traveled to distant parts of the globe and who routinely trek around in areas I would not consider — draw the line at wrangling ducks. This I learned only after opening the pet carrier door in the BDN parking lot and having Donald make a noisy, quacking break for it amid an impressive flapping of wings. Petunia was right on his webbed heels. As I dove forward to block the attempted escape, out of the corner of my eye I saw my colleagues each take several giant steps away from the fracas. With visions of Donald and Petunia making good on their escape plans and ending up either living on the nearby Penobscot River or taking up with the pigeons in Pickering Square, I took a deep breath and managed to grab Petunia by the neck and secure Donald in a sort of ducky half-nelson. That’s when I learned ducks have claws on the ends of those webbed toes. Who knew? I mean, really, for what possible evolutionary purpose do ducks need claws? Other than scratching hapless reporters. This lessen was quickly followed by Donald demonstrating just how hard a duck can bite. It was only after I had managed to get Petunia secured back in the pet carrier and had a firm grip on Donald that my colleagues joined me for a quick photo op. We had just finished and I had gotten Donald back into the carrier when his new owners pulled in, pleased as punch to take them off my hands. I was more than happy to turn the flustered, but otherwise unscathed ducks over to the very nice woman and her children. Several days later I heard from Donald and Petunia’s new family that they were settled in and quite happy. That really was nice to hear. But next time a duck needs to head south, they can fly with the rest of migrating birds.